Color psychology is the study of hues as a determinant of human behavior. Color influences perceptions that are not obvious, such as the taste of food. Colors can also enhance the effectiveness of placebos. For example, red or orange pills are generally used as stimulants. Color can indeed influence a person; however, it is important to remember that these effects differ between people. Factors such as gender, age, and culture can influence how an individual perceives color. For instance, heterosexual men tend to report that red outfits enhance female attractiveness, while heterosexual females deny any outfit color impacting that of men. Color psychology is also widely used in marketing and branding. Many marketers see color as an important part of marketing because color can be used to influence consumers’ emotions and perceptions of goods and services. Companies also use color when deciding on brand logos. These logos seem to attract more customers when the color of the brand logo matches the personality of the goods or services, such as the color pink being heavily used on Victoria’s Secret branding. Colors are also important for window displays in stores. Research shows that warm colors tended to attract spontaneous purchasers, despite cooler colors being more favorable. Perceptions not obviously related to color, such as the palatability of food, may in fact be partially determined by color. Not only the color of the food itself but also that of everything in the eater’s field of vision can affect this. For example, in food stores, bread is normally sold in packaging decorated or tinted with golden or brown tones to promote the idea of home baked and oven freshness. The color of placebo pills is reported to be a factor in their effectiveness, with “hot-colored” pills working better as stimulants and “cool-colored” pills working better as depressants. This relationship is believed to be a consequence of the patient’s expectations and not a direct effect of the color itself. Consequently, these effects appear to be culture-dependent. In 2000, Glasgow installed blue street lighting in certain neighborhoods and subsequently reported the anecdotal finding of reduced crime in these areas. This report was picked up by several news outlets. A railroad company in Japan installed blue lighting on its stations in October 2009 in an effort to reduce the number of suicide attempts, although the effect of this technique has been questioned. A preference for blue and green may be due to a preference for certain habitats that were beneficial in the ancestral environment as explained in the evolutionary aesthetics article. There is evidence that color preference may depend on ambient temperature. People who are cold prefer warm colors like red and yellow while people who are hot prefer cool colors like blue and green. A few studies have shown that cultural background has a strong influence on color preference. These studies have shown that people from the same region regardless of race will have the same color preferences. Also, one region may have different preferences than another region (i.e., a different country or a different area of the same country), regardless of race. Blue is the top choice for 35% of Americans, followed by green (16%), purple (10%) and red (9%). Some studies find that color can affect mood. However, these studies do not agree on precisely which moods are brought out by which colors. A study by psychologist Andrew J. Elliot tested to see if the color of a person’s clothing could make them appear more sexually appealing. He found that, to heterosexual men, women dressed in the color red were significantly more likely to attract romantic attention than women in any other color. The color did not affect heterosexual women’s assessment of other women’s attractiveness. Other studies have shown a preference for men dressed in red among heterosexual women. Common associations connecting a color to a particular mood may differ cross-culturally. For instance, one study examined color associations and moods using participants from Germany, Mexico, Poland, Russia, and the United States. The researchers did find some consistencies, including the fact that all nations associated red and black with anger. However, only Poles associated purple with both anger and jealousy and only Germans associated jealousy with yellow. These differences highlight how culture influences peoples’ perceptions of color and color’s relationship to mood. De Craen, A. J.; Roos, P. J.; Leonard De Vries, A.; Kleijnen, J. (1996). Effect of colour of drugs: Systematic review of perceived effect of drugs and of their effectiveness. BMJ (Clinical research ed.). 313 (7072): 1624–1626. Blue streetlights believed to prevent suicides, street crime. The Seattle Times. 2008-12-11. Archived from the original on September 13, 2010. Dutton, Denis. (2003). Aesthetics and Evolutionary Psychology. The Oxford Handbook for Aesthetics. Oxford University Press. Whitfield, T. W. A., & Wiltshire, T. J. (1990). 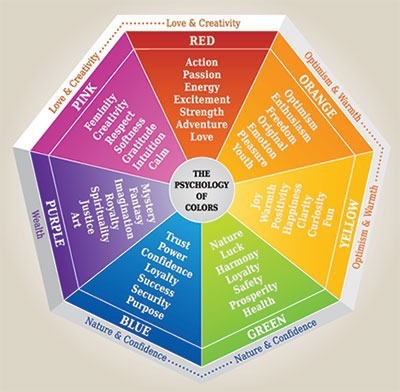 Color psychology: A critical review. Genetic, Social and General Psychology Monographs. 116 (4): 387. Hupka, Ralph B.; et al. (March 1997). The colors of anger, envy, fear, and jealousy: a cross-cultural study. Journal of Cross-Cultural Psychology. 28: 2. Riley, Charles A. II. (1995). Color Codes: Modern Theories of Color in Philosophy, Painting and Architecture, Literature, Music, and Psychology”. Hanover: University Press of New England, 1995, p. 307. Labrecque, Lauren I.; Milne, George R. (2012). Exciting Red and Competent Blue: The Importance of Color in Marketing. Journal of the Academy of Marketing Science. 40 (5): 711–727.